IOTA (MIOTA) is a distributed ledger designed with a directed acyclic graph (DAG) system with an aim to record and implement a transaction between machines. All the records are kept here on the Internet of Things (IoT) ecosystem. A non-profit organization designed IOTA with an aim to be the leader in the market with respect to transactions between devices on the IoT platform. IOTA (MIOTA) has recently made agreements for IoT platform with major firms like Bosch and Volkswagen (German). IOTA (MIOTA)’s design supports tangle technology which gives the coin unlimited scalability. All the IoT based transactions based on this platform is free of cost. IOTA (MIOTA) is ranked 15 on the cryptocurrency market with an ROI of negative 51.59 %. Both the circulating limit and the coin circulation are at 2,779,530,283. Though the year started on a higher note despite Crypto winter, by the end of January IOTA showed some weaknesses. The year started with a market cap of 991,552,332 USD. The current value of market cap on 01-04-2019 at 03:00 UTC is 858,350,818 USD. The value of each coin and with respect to BTC stands at 0.308811 USD and 0.00007499 BTC at the same UTC. The 24h volume remains at 11,477,786 USD. The highest point of IOTA was in January, but it was dragged down severely later on. The ride of IOTA has been very rough. The high note it initiated could not be sustained for long. Its highest point on January 03 was as high as 1,096,552,700 USD in market cap whereas it touched the lowest point within two months at 755,490,339 USD. 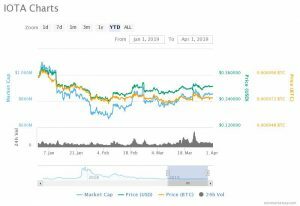 On February 24, like all other major cryptocurrencies, it gained some points and stood at 900,471,115 USD as far as the market cap is concerned. The current market cap 4.67 % less than the value of February 24. The same trend could be seen on the price of each coin on USD. The current price of each coin is 4.7 % less than the price of February 24, which stood at 0.323965 USD. The price with respect to BTC on February was 0.00007780 BTC. Despite the lower trend, IOTA (MIOTA) has been perceived on optimistic notes by many in the industry. As this coin is not conventionally based on blockchain platform, it may lose out some effects of the conventional market. As per some optimistic experts, the coin may reach as high as 4 USD by the end of this year. But some have predicted that it is evident that IOTA (MIOTA)’s price is reaching a minimum of 1.13 USD by the starting of 2020. As there are some stories of more upcoming MoUs with major companies globally, the value of IOTA may reach its highest point in this quarter itself. So, the investors are advised to hold their positions for a while and sell it on the perfect time with a target above 1.2 USD. For long term holders, this coin is likely to bring heavy profits. ← Electroneum Price Attempts to Move up !